Mapping biopsies are performed prior to treatment planning of the skin cancer. 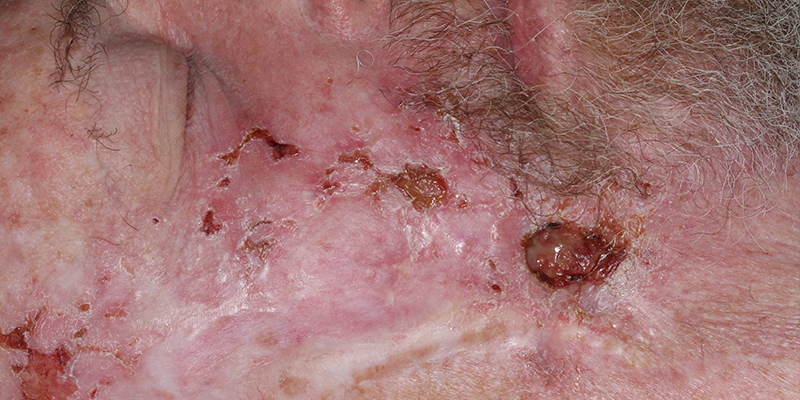 Although the extent of most skin cancers could be easily determined with visual inspection and digital palpation, some lesions are not so obvious. Preparing the patient for treatment plan requires knowledge of the extent of a possible carcinoma. Whether it is Mohs surgery or radiation therapy planning, both cases would benefit from knowing the margins of the cancer involvement. Imaging frequently fails in staging local extent of the skin cancers. Therefore, the only modality left for adequate staging the cancer and predicting possible surgical defect is with mapping biopsies. Mapping biopsies can be performed in the office setting under local anesthesia, but occasionally require IV sedation and surgical setting for patient's comfort. A 2-3 mm punch biopsies and shaved biopsies can be used to map out skin cancer involvement in the surrounding area. Both cancer-free biopsies and cancer involved biopsy results require to adequately map the cancer. In our Center, we use a minimum of four biopsies to as many as 20 biopsies to stage various cancers. Cancers involving paranasal area frequently require intranasal biopsies to rule out full-thickness involvement or intranasal and mucosal involvement. Intranasal biopsies require the use of nasal endoscope and an otolaryngologist to obtain them. Once mapping biopsies defined what the cancer involves and does not involve, the patient can be adequately prepared for the reconstructive surgery necessary. At that point, a determination can also be made whether Mohs surgery can be done under local anesthesia _____ best be done in the operating room setting under IV sedation. Finally, involvement of bone with deeply invasive carcinoma is of great importance to predict whether bone resection is necessary. This way, the patient can be prepared for both Mohs excision of soft tissue portion of carcinoma and subsequent radical bone resection under the tumor and with delay of reconstruction. The latter is necessary in order for bone to be decalcified and histologically evaluated for cancer involvement. Finally, mapping biopsies are very useful in determining the extent of radiation necessary. If the tumor is limited, then simple office-based superficial radiotherapy could be utilized. If the tumor is much more involved requiring a 3-dimensional application of radiation energies, then hospital-based electron beam radiation therapy would be required. Mapping biopsy is an underutilized modality, but would avoid patient's surprises, physician surprises, and inadequate surgical planning of cancer treatment.